Intramuscular myxoma (IM) is a hypocellular benign soft tissue neoplasm characterized by abundant myxoid stroma and occasional hypercellular areas. These tumors can, especially on biopsy material, be difficult to distinguish from low-grade fibromyxoid sarcoma or low-grade myxofibrosarcoma. GNAS mutations are frequently involved in IM, in contrast to these other malignant tumors. Therefore, sensitive molecular techniques for detection of GNAS aberrations in IM, which frequently yield low amounts of DNA due to poor cellularity, will be beneficial for differential diagnosis. In our study, a total of 34 IM samples from 33 patients were analyzed for the presence of GNAS mutations, of which 29 samples were analyzed using a gene-specific TaqMan genotyping assay for the detection of GNAS hotspot mutations c.601C > T and c602G > A in IM, and 32 samples using a novel next generation sequencing (NGS)-based approach employing single-molecule tagged molecular inversion probes (smMIP) to identify mutations in exon 8 and 9 of GNAS. Results between the two assays were compared for their ability to detect GNAS mutations with high confidence. In total, 23 of 34 samples were successfully analyzed with both techniques showing GNAS mutations in 12 out of 23 (52%) samples. The remaining 11 samples were analyzed with either TaqMan assay or smMIP assay only. The TaqMan assay revealed GNAS mutations in 16 out of 29 samples (55%), with six samples c.601C > T (p.R201C; 38%) and ten samples c.602G > A (p.R201H; 62%) missense mutations. The smMIP assay identified mutations in 16 out of 28 samples (57%), with five samples c.601C > T (p.R201C; 31%) and seven samples c.602G > A (p.R201H; 44%) missense mutations. In addition, four samples (25%) revealed novel IM-associated mutations, including c.601C > A (p.R201S), c.602G > T (p.R201L), c.602G > C (p.R201P) and c.680A > G (p.Q227R). Combining the results of both tests, 23 out of 34 sporadic IM samples (68%) showed a GNAS mutation. Both the TaqMan and the smMIP assay a show a high degree of concordance in detecting GNAS hotspot mutations in IM with comparable sensitivity. However, since the NGS-based smMIP assay permits mutation detection in whole exons of GNAS, a broader range of GNAS mutations can be identified by the smMIP approach. Intramuscular myxoma (IM) is a benign soft tissue neoplasm that belongs to the group of myxoid tumors characterized by a marked abundance of extracellular myxoid matrix. These tumors share several histological features, and depending on their clinical presentation and place of origin, can be subdivided into intramuscular, superficial-cutaneous, odontogenic and juxta-articular myxoma [1, 2]. These myxomas all represent distinct entities with different characteristic gene lesions involved in their pathogenesis. Therefore, gene mutation analysis can be very helpful in differential diagnosis to support the histopathology of these tumors [3, 4]. IM is characterized by bland spindle- and/or stellate-shaped cells embedded in a hypovascular, abundant myxoid stroma. The nuclei are small showing no or minimal nuclear atypia. Often areas with increased cellularity can be observed and when hypercellular areas predominate it is designated as cellular myxoma [2, 5, 6], which can easily be confused with low-grade fibromyxoid sarcoma or low-grade myxofibrosarcoma, especially in very small biopsies. IM is a somatic mosaic disorder generally occurring as a sporadic solitary neoplasm, although it can be part of Mazabraud’s syndrome characterized by a combination of polyostotic fibrous dysplasia with multiple IM’s [7, 8]. Mazabraud’s syndrome and the closely related McCune-Albright syndrome, which is associated with fibrous dysplasia, café au lait macules and endocrine disorders, are caused by activating missense mutations in codon 201 of the GNAS gene [8–12]. GNAS encodes the stimulatory G-alpha subunit of the heterotrimeric G-protein complex, which regulates activation of adenylyl cyclase that converts adenosine triphosphate (ATP) into cyclic adenosine monophosphate (cAMP). Overproduction of second messenger cAMP and activation of downstream signaling pathways has been observed in cells harboring GNAS mutations [13, 14]. In 2000, Okamoto et al. first described somatic post-zygotic GNAS mutations in IM with and without fibrous dysplasia . Thereafter, three more studies showed that GNAS lesions occur frequently in sporadic IM, which were detected in 36–61% of the cases, and exclusively involved c.601C > T (p.R201C) and c.602G > A (p.R201H) mutations [8, 15, 16]. On the other hand, GNAS mutations are absent in low-grade myxofibrosarcoma, which can be useful in the differential diagnosis with (cellular) IM [17, 18]. Notably, juxta-articular myxoma and cardiac myxoma also lack GNAS driver mutations [4, 16]. A complicating factor for mutation detection in IM is the mosaicism of GNAS mutations combined with hypocellularity of the tumor, where low concentrations of genomic DNA are isolated from these tissue specimens, especially in the case of biopsy material. In the past decades, several techniques for GNAS mutation detection have been developed and used [8, 19–21]. In 2009, Delaney et al. tested 28 IM’s for GNAS mutations by using conventional PCR followed by mutation-specific restriction enzyme digestion (PCR-MSRED) and COLD-PCR/MSRED and showed that COLD-PCR/MSRED was more sensitive than the conventional PCR (61% vs. 29% mutations) . Thus, this tumor type may benefit from the development of more robust and sensitive techniques for mutation detection, such as next generation sequencing (NGS). Recently, our molecular diagnostic laboratory has developed a novel NGS-based approach employing single-molecule molecular inversion probes (smMIP) that combines multiplex analysis with single-molecule tagging, also named Unique Molecule Identifiers (UMI) [22, 23]. By using this method, duplicate reads can be identified and merged into a single consensus, reducing false-positive calls originated during PCR and sequencing and allowing a technical sensitivity of 1% mutant allele. In addition, the actual number of sequenced genomic DNA (gDNA) molecules can be determined, which is especially relevant when analyzing limited amounts of gDNA. Furthermore, the strand-specific amplifications allows the distinction between genuine C > T and G > A mutations from deamination artifacts frequently observed when sequencing gDNA in older formalin-fixed paraffin-embedded (FFPE) tissue specimens. [22, 23]. In this study, we applied both TaqMan-based assays and the smMIP technique for GNAS mutation detection in IM, and compared both methods for reliable mutation detection in a diagnostic setting. This study included 34 samples of sporadic intramuscular myxoma from 33 patients that were collected retrospectively (from 1998 till 2018) from archives of the Pathology Departments in the Netherlands of the Radboud University Medical Centre, Jeroen Bosch Hospital (Den Bosch), PAMM institute (Eindhoven) and Rijnstate Hospital (Arnhem). None of the patients were prior diagnosed with fibrous dysplasia or developed this during follow-up. From one patient, two samples (sample 28 and 29) were analyzed, which yielded identical data for mutation analyses. For each case, a 4 μm thick section of FFPE material was stained with haematotoxylin and eosin (H&E). The histological diagnoses were revised (UF, EB) and classified according to the 2013 World Health Organization criteria . The samples included in this study complied with the standards of the Committee for Human Research Ethics (CMO). Three 20 μm thick sections were cut from each specimen of FFPE tissue and were digested at 56 °C for at least 1 h in the presence of TET-lysis buffer (10 mmol/L Tris/HCl pH 8.5, 1 mmol/L EDTA pH 8.0, 0.01% Tween-20) with 5% Chelex-100 (143 to 2832; Bio-Rad, Hercules, CA), 15 μg/mL GlycoBlue (AM9516; Thermo Fisher, Waltham, MA), and 400 μg proteinase K (19,133; Qiagen, Valencia, CA), followed by inactivation at 95 °C for 10 min. DNA concentration for TaqMan assay was assessed with the NanoDrop Microvolume Spectrophotometer (Peqlab Biotechnologies, Erlangen, Germany) and for smMIP assay with the Qubit Broad Range Kit (Q32853; Thermo Fisher). To concentrate the DNA samples for the robotized protocol of the smMIP procedure, supernatant was cooled on ice and precipitated in the presence of 70% EtOH and 1/10 volume 3 M NaAc (pH 5.2). Pellets were washed with cold 70% EtOH and dissolved in 80 μL Tris-EDTA. DNA quality of the samples was tested using a size ladder control PCR, in which gene segments of house-keeping genes were amplified, yielding different fragment sizes (100, 200, 300 and 400 bp), depending on the extent of fragmentation of the DNA. Pre-designed and validated gene-specific TaqMan Genotyping Assays from Thermo Fisher Scientific was used for quantitative real-time RT-PCR. Every set contained gene specific forward 5’-CTTTGGTGAGATCCATTGACCTCAA-3′ and reverse primers 3’-CACCTGGAACTTGGTCTCAAAGATT-5′ and fluorescence labeled probes (Table 1). Probes are spanning an exon junction to detect genomic DNA. The PCR reaction volume was 20 μl and contained 1 μl DNA (10 ng/μl), 10 μl TaqMan Universal PCR Mastermix NoAmpErase UNG (Applied Biosystems, Foster City, CA), 0,5 μl predesigned and validated gene-specific TaqMan Gene Expression Assay mix (Applied Biosystems), 0,5 μl TE buffer (Promega) and 8 μl water. ABI Prism 7500 Real-Time PCR system (Applied Biosystem) was used to amplify codon 201 of exon 8 of the GNAS gene from each sample on a 96-well reaction plate with the following protocol: 10 min denaturation at 95 °C, 40 cycles of 15 s denaturation at 95 °C, 1 min annealing and extension at 60 °C. Dilution studies were performed using fibrous dysplasia samples harboring the two previously described GNAS mutations. The limit of detection was reliable at a variant allele frequency (VAF) of 5%. The single-molecule molecular inversion probe (smMIP) procedure was performed as described elsewhere . In short, a pool of smMIPs covering 41 mutational hotspot regions of 23 distinct genes, including GNAS, was phopshorylated with T4 polynucleotide kinase. A total of 100 ng genomic DNA was used as input in the capture reaction with the diluted phosphorylated smMIP pool. After extension, ligation and exonuclease treatment, PCR reactions were performed with barcoded reverse primers and iProof high-fidelity master-mix (Biorad). PCR reactions of the different samples were pooled, and purified with 0.8 x volume of Agencourt Ampure XP Beads (Beckman Coulter, Brea, CA). The purified libraries were prepared for sequencing on a NextSeq 500 instrument (Illumina, San Diego, CA) according to the manufacturer’s protocol (300 cycles Mid Output sequencing kit, v2), resulting in 2 × 150 bp paired-end reads. Data analyses were performed as previously described . Variants were called at a VAF of > 1% and ≥ 3 mutant gDNA molecules and a minimum of 20 gDNA molecules analyzed at that position. Samples that did not fulfil the standard settings with respect to gene coverage in combination with tumor load were marked as inconclusive . Histopathology of H&E-stained slides confirmed that a selected set of 34 samples from 33 patients showed the classical features of IM, which were composed of uniform, sparsely distributed cytological bland spindle- or stellate-shaped cells with tapering eosinophilic cytoplasm and small nuclei embedded in an abundant myxoid stroma. One case showed prominent hypercellular areas with more collagenous stroma and was diagnosed as cellular myxoma according to the criteria defined by Nielsen et al (Fig. 1) [5, 6]. Of the 34 myxoid tumors, 31 samples were obtained by local excision and 3 samples by needle biopsy (Table 2). From one patient (sample 28 and 29), a biopsy and the following excision were analyzed for GNAS mutational status. No recurrences were reported in any of the cases and no additional treatment was given. Follow up time ranged between 2 months and 21 years. All samples (n = 34) were tested for the presence of GNAS mutations, 32 samples using the smMIP assay and 29 samples with the TaqMan genotyping assay. First, GNAS mutation detection was performed for 29 DNA samples with the TaqMan assay, where specific fluorescently labeled probes were used for the detection of c.601C > T (p.R201C) and c.602G > A (p.R201H) hotspot mutations (Fig. 2). Each sample was analyzed in two independent assays together with both negative and positive control samples. GNAS genetic alterations were identified in 16 out of 29 samples (55%), with six samples c.601C > T (38%) and ten samples c.602G > A (62%) mutations (Table 3). From one patient both samples (biopsy and excision) were positive for c.601C > T mutation (Table 3; sample 28 and 29). Next, we determined the presence of GNAS mutations in exon 8 and exon 9 by the smMIP assay. Within the smMIP Cancer Hotspot Panel, two smMIPs covered GNAS exon 8 (providing sequencing analysis of both DNA strands for a total 74 bp) and two smMIPs GNAS exon 9 (sequencing analysis of 59 bp), respectively (Fig. 3). Other mutational hotspot regions that were covered by smMIPs included BRAF, CTNNB1, EGFR, HRAS, KRAS, NRAS, IDH1, IDH2 and KIT (for the complete list see ). The smMIP assay was performed on 32 samples in total, including the 27 samples that also showed a successful TaqMan assay and an additional set of 5 IM samples. From these 32 samples, the NGS data of 5 samples (for which a successful TaqMan assay was available) was based on a very limited number of gDNA molecules, and therefore could not reliably be interpreted, most likely because of very low cellularity of the IM sample and/or inferior DNA quality (Table 3; inconclusive, Inc). In total, 16 out of 28 samples (57%) showed a GNAS mutation, with five samples c.601C > T (31%) and seven samples c.602G > A (44%) mutations. In addition, four samples (25%) revealed novel IM-associated mutations, including c.601C > A (p.R201S), c.602G > T (p.R201L), c.602G > C (p.R201P) and c.680A > G (p.Q227R). Combining the above, 23 samples were successfully analyzed with both techniques showing GNAS mutations in 12 out of 23 (52%) samples. Collectively, our data demonstrate that in 23 out of 34 IM samples (68%) a GNAS mutation was detected using either TaqMan and/or smMIP assay. All samples that were successfully analyzed with both approaches and harbored the classical c.601C > T or c.602G > T mutations were identified with both methods. In total, eight samples showed the classical c.601C > T mutation (35%) and eleven samples harbored the c.602G > T mutation (48%). All hotspot mutations detected by smMIP were also identified by the TaqMan assay, including samples with a VAF of 5% (sample 2). On the other hand, due to the more stringent settings of the smMIP assay, five cases with hotspot mutations identified by TaqMan assay did not yield sufficient data by the smMIP approach for reliable interpretation. In contrast, the smMIP assay allowed the detection of four novel (potential) pathogenic GNAS mutations (17% of the 23 mutated samples) beyond the c.601C > T and c.602G > A mutations, not previously described for IM. Thus, both assays provide merits in the molecular diagnostics of IM. Intramuscular myxoma (IM) mostly occurs sporadically in the skeletal muscle of the thigh. These lesions affect mainly middle-aged adults, women more often than man [1, 24]. The prevailing view is that driver mutations of this neoplasm are exclusively located in codon 201 of the GNAS gene, encoding the stimulatory G-protein alpha subunit that activates the enzyme adenylate cyclase. Due to the low cellularity and somatic mosaicism in most of these lesions, mutation detection can be quite challenging and the presence of a mutation can be easily missed. In our study we used two different techniques (TaqMan and smMIP assay) to compare the detection sensitivity of GNAS mutations in these lesions. In our series, 23 out of 34 sporadic IM cases (68%) showed a GNAS mutation, 16 out of 29 samples (55%) in the TaqMan assay and 16 out of 28 samples (57%) in the smMIP assay of which 23 samples were successfully analyzed with both techniques showing GNAS mutations in 12 out of 23 (52%) samples. The test-specific detection rate was 55% with the TaqMan assay and 57% for the smMIP approach. The VAF for the TaqMan assay was determined at > 5% in this study and the required input was only 10 ng gDNA. The VAF for smMIP was set at > 1% and a minimum of 3 mutant gDNA molecules, and a coverage of 20 gDNA molecules. 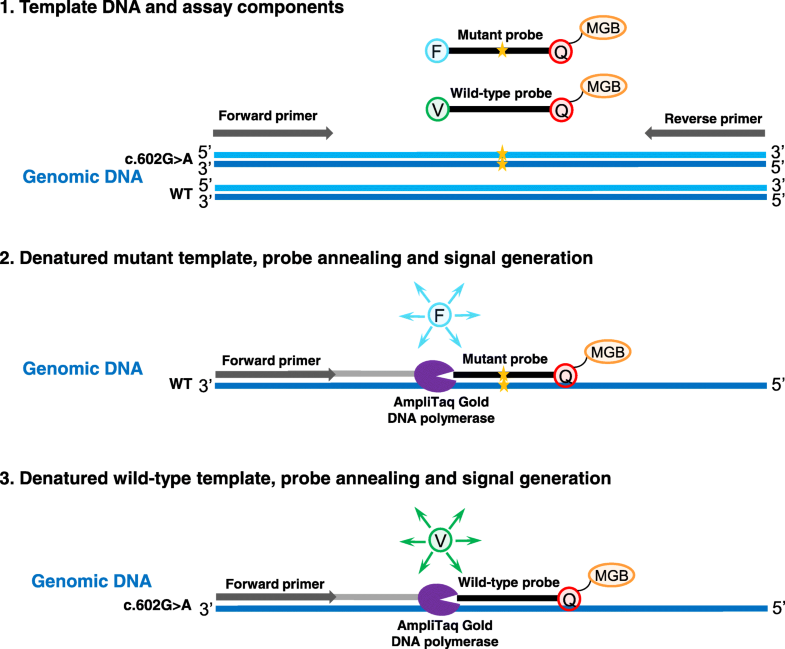 This demonstrates that both tests are sensitive methods and useful for molecular diagnostics of tumor samples harboring mutations with a low mutant allele frequency. In comparison, Walther et al found GNAS mutations in 37% (23/63) of IMs with direct Sanger sequencing and Delaney et al detected mutations in 61% (17/28) using COLD-PCR/MSRED [15, 16]. However, the smMIP technique, because of the whole exon sequencing nature of this test, allowed detection of four additional mutations that previously have not been described in IM. By using smMIP we identified one c.680A > G mutation in exon 9, and three novel mutations in exon 8, one mutation at position c.601, namely c.601C > A, and two mutations at position c.602, which included c.602G > C and c.602G > T. The c.601C > A mutation has previously been reported in fibrous dysplasia, while the c.602G > C and c.602G > T mutations were only reported in sporadic endocrine tumors so far [9, 10, 19, 25]. These mutations were not detected by TaqMan, since this assay was designed to report only the two classical hotspot mutations c.601C > T and c.602G > T.
The smMIP approach allows the distinction between genuine C > T and G > A mutations from deamination artifacts frequently observed when sequencing gDNA from FFPE tissue specimens . All cases harboring a C > T or G > A mutation in GNAS, mutant reads originating from both DNA strands were observed, showing that these represent genuine mutations. Since the TaqMan approach does not allow this distinction, deamination artifact could potentially cause false positive results. In our study, all hotspot mutations detected with the Taqman assay were confirmed with the smMIP technique, indicating no false-positive results with Taqman. Even samples with a VAF of around 5% could be detected by both TaqMan assay and smMIP. The four samples with a hotspot mutation that were detected by TaqMan, but did not yield a reliable smMIP assay result, all had a mutated VAF of approximately 10–30% as judged by Taqman assay, and were therefore interpreted as true mutations. Significant benefits of the TaqMan assay include low cost and short turn-around time (≤2 working days). A limitation of Taqman is that within one assay only one or two hotspot mutations can be detected. For smMIP analysis the turn-around time in our laboratory is ≤7 working days. A large initial investment was needed and high numbers of samples are required for parallel analyses to have a cost-efficient test. Because multiple genes can be tested at once with the smMIP assay, large amounts of samples are relatively easy obtained in routine clinical setting with the current demand of molecular diagnostics . 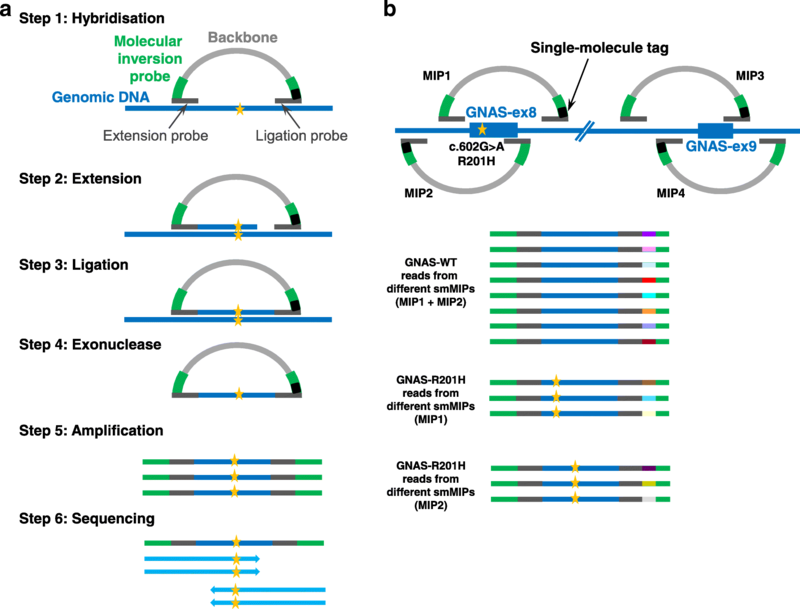 Because of the sensitive characteristics of the smMIP technique and its accuracy of mutation detection on FFPE material as well as the broader coverage of the GNAS gene, this technique to our opinion is preferable. The most important differential diagnoses of IM, especially the cellular variant, are low-grade fibromyxoid sarcoma and low-grade myxofibrosarcoma. In biopsy material the distinction can be challenging and in those cases molecular diagnostics can be beneficial. A specific immunohistochemical and molecular signature is well known for low-grade fibromyxoid sarcomas with expression of MUC4 and the presence of FUS/EWSR1-CREB 3 L2/1 fusions making a distinction from IM easily possible [17, 18]. 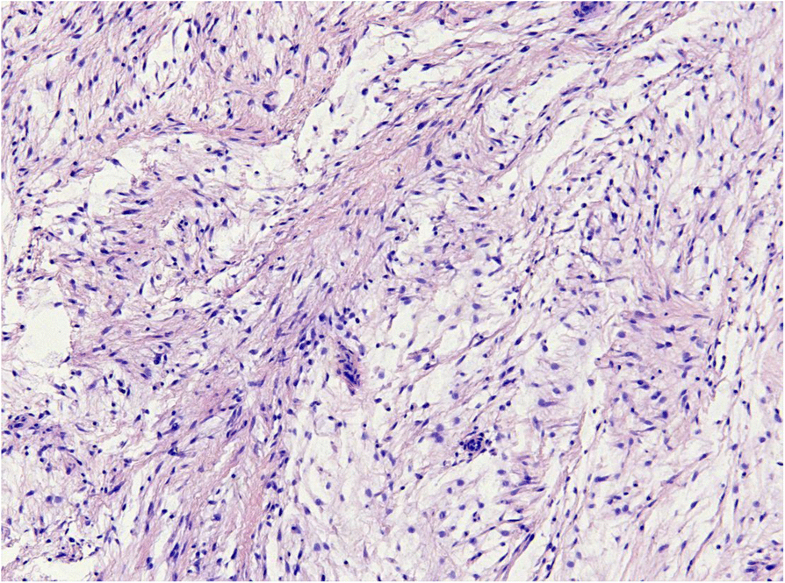 In contrast, for low-grade myxofibrosarcoma, specific immunohistochemical or molecular characteristics are lacking. Sensitive molecular tests, like smMIP and TaqMan assays for GNAS mutation analysis, might be very helpful in assessing the diagnosis, which has therapeutic consequences when considering malignancy . Nevertheless there are also cases in which no GNAS mutation could be detected, suggesting that there are still other aberrations to be identified in IM. Panagopoulos et al recently found abnormal karyotypes in 21 out of 68 cases, with nine cases showing nonrandom involvement of chromosome 8 (which harbors the GNAS gene) with seven cases showing trisomy 8, one with a deletion and one with a translocation. Only one case in their series showed a c.601C > T GNAS mutation . Thus, chromosomal aberrations could be an alternative explanation for at least a subset of the non-mutated cases. The smMIP-NGS cancer hotspot panel that was employed to check for GNAS mutations, also contained smMIPs that covered mutational hotspots in the genes AKT1, BRAF, CTNNB1, EGFR, ERBB2, GNA11, GNAQ, H3F3A, H3F3B, HRAS, IDH1, IDH2, JAK2, KRAS, MPL, MYD88, NRAS, PDGFRA and PIK3CA. In none of the 32 samples that could be reliably analyzed by smMIPs, additional mutations were detected in these regions. Thus, GNAS mutations represent a unique driver mutation for this benign tumor type. In conclusion, both TaqMan and smMIP assay are comparably sensitive molecular methods with valuable applicability in diagnostic pathology for IM. Furthermore, due to a broader coverage of the GNAS gene by the smMIP approach, four novel IM-associated missense mutations of GNAS could be identified (17% of all mutated samples), which previously have only been reported in McCune-Albright syndrome and sporadic endocrine tumors. EB contributed to study design, laboratory work, revised pathology and is the main contributor to writing the manuscript. UF contributed to study design, writing the manuscript, and revised pathology. BS contributed to study design, laboratory work and was a major contributor in writing the manuscript. AE contributed to laboratory work and provided data and for and helped writing methods section in manuscript. PR contributed to laboratory work and writing methods section in manuscript. SM, PZ and ER provided tissue samples. All authors have read and approved the final version to be published. Ethical approval was obtained by the Committee for Human Research Ethics (CMO). No consent to participate was needed from the participants.